Christian Capitalism: Recession without rising rates? Can a recession, and the simultaneous meltdown of the stock market, happen without the Fed raising rates? Hayek wrote Prices, Interest and Investment to show that it could and he used Ricardo Effect as the principle to demonstrate it. When I decided to teach an intro class in economics at a small private college, I worried about delivering mainstream economics when I had become convinced of the Austrian approach after earning an MA in managerial economics at the University of Oklahoma. But as I taught I realized that mainstream economics textbooks teach a lot of Austrian economics; mainstream economists just don’t know it. Mainstream economics textbooks present economics as a series of unrelated topics. Even mainstream macro economists have recognized the animosity between micro and macro. I found that the Austrian aspects come out when I stitch together those disjointed topics. Here is an example of how I teach the Austrian business-cycle theory and Hayek’s Ricardo Effect using nothing but the tools presented in standard intro textbooks. Resurrecting Hayek’s Ricardo Effect will disappoint a few Austrian followers who, having done a quick search of the internet on the topic, have decided that critics demolished Hayek’s theory decades ago. Hayek introduced the effect in his Prices, Interest and Investment and amplified it in The Pure Theory of Capital. The only contemporary author that I’m aware of who takes it seriously is Jesus Huerta de Soto in his book, Money, Bank Credit and Economic Cycles. I include it in my book, Financial Bull Riding. Hayek didn’t respond to many of his critics so some assume that Hayek had given up on the Ricardo Effect, but he hadn’t. Hayek recognized that his critics didn’t understand the effect because they had a poor grasp of capital theory. In fact, anyone who has read the three descriptions of the effect mentioned above will immediately grasp that Hayek’s critics attacked straw men, but never Hayek’s Ricardo Effect. Hayek answered his critics with Pure Theory of Capital. So how do mainstream economics textbooks teach the Ricardo Effect? Let’s start with a production possibility frontier (PPF) that I borrowed from Dr. Roger Garrison but which the reader will find in most textbooks under the topic of tradeoffs. Below is a PPF of the tradeoffs between consumption and investment. The economy can grow only by pushing the curve outward from the origin, and in the short run we push by increasing investment. 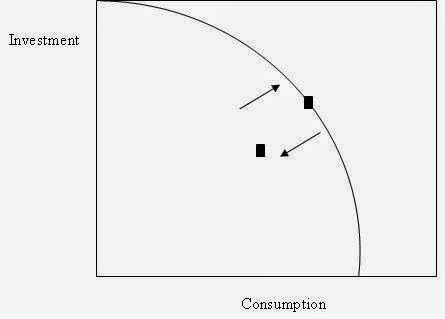 The tradeoff is that we have to reduce consumption in order to provide the funds necessary for an increase in investment. Of course, that assumes a fixed money supply. In other words we have to slide along the curve in the northwesterly direction. Increased investment in the short run pushes the curve outward and increases both investment and consumption in the long run. So what goes wrong? In a recession, the economy doesn’t sit on the PPF; it sits inside the curve toward the origin because the economy doesn’t operate at full potential. The Fed wants to push the economy back to the position on the PPF it held before the recession and does so by reducing interest rates. Lower rates persuade businesses to borrow and invest. Because of unemployment and slack resources, the money trick works for a while. The economy moves outward and may move beyond its PPF during the expansion phase of the business cycle. But it can move beyond the PPF only if firms consume capital. This is when the Ricardo Effect kicks in. At some point in the expansion consumer prices begin to rise because consumers aren’t saving enough to finance increased investment. Also, investment and consumption rise together but it takes time for the new investments to generate an increase in consumer goods so shortages develop and prices rise. Hayek’s modern critics need to pay close attention here. It’s common for critics to claim that the ABCT says that investment and consumption move in opposite directions during the expansion. Then they look at the data and find that the two rise together and exclaim they have proven the ABCT wrong. The ABCT does claim that investment and consumption move in opposite directions, but only on the assumption of a fixed stock of money. Under that assumption, savings finance investment. Hayek and Mises start their analyses of business cycles with that assumption. It’s the right way to do economics. But fixed stock of money, or an inelastic supply as mainstream would put it, makes business cycles impossible. Critics miss the fact that Mises and Hayek relax that assumption when they explain the business cycle. The stock of money grows due to loose monetary policies. With an elastic money supply, both Mises, Hayek and all Austrian economists explain that consumption and investment increase at the same time. Not grasping the change in assumptions from a fixed money supply to an elastic one is the most common mistake I see critics of the ABCT make. Rising consumer prices mean greater profits for consumer goods makers and the marginal revenue product of labor curve taught in micro explains the implications of rising prices. The following comes from the current textbook the college where I teach uses. Marginal revenue product of labor (MRPL) describes the contribution to the revenue of a firm from the addition of one worker. 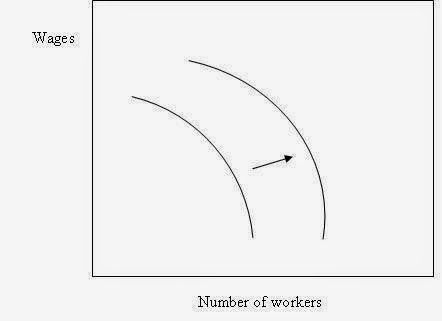 Rising prices cause the MRPL curve in the graph below to shift to the right, meaning that firms employ more labor. 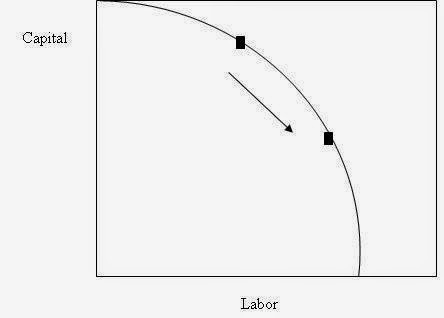 When firms employ more labor, they buy less capital equipment because in the short run resources are limited, which brings us to the third PPF taught in micro textbooks showing the tradeoffs firms make between capital and labor in the graph below. Businesses sacrifice purchases of capital equipment such as computers and software in order to finance the use of more labor. Here’s where I make the leap to Austrian economics and back to macro: the capital/labor tradeoff at the micro level is the same as the macro tradeoff in Austrian economics between capital goods industries and consumer goods industries. Producers in capital good industries lose sales at the same time that the prices of their inputs, labor and materials, have risen because of competition for them from the consumer goods sector. Profits fall for capital goods producers, causing some firms to go bankrupt and many to lay off workers and so the recession begins. Now go back to the first PPF at the top showing the tradeoffs between investment and consumption. Investment in the capital goods sectors falls, causing the economy to abandon the PPF and fall to a position inside the curve where there are many unused resources and high unemployment. Modern mainstream macro economics is closer to superstition than science, but Austrian economics can rescue it. Mainstream economics textbooks present a lot of good economics, but in disconnected parts. It resembles an airplane kit that the pilot has to assemble himself but for which he gets no instructions. Austrian econ provides the assembly instructions that empower the pilot to assemble the pieces and launch powerful economic theory that will take him to greater economic heights. Arthur O’Sullivan, Steven M. Sheffrin, Stephen J. Perez, Survey of Economics: Principles, Applications, and Tools, New York: Prentice Hall, 2012, p.254.